Hello my lovely readers. Apologies for my long absence (well long-ish) I had been feeling pretty down and it was really affecting my creativity so I took a break to get through my writer's block. So then, it was my birthday on Saturday meaning that I am now officially 24, I had an amazing day and got loads of lovely presents. In all honestly it doesn't feel much different to be 24 the only odd thing is saying I'm 24. When I was young I thought by 24 I'd have my own house and be married hahahahahahahahaha oh, young naive Ella. From time to time I do get a stab of fear that I've not done much with my life and that I'm not where I should be but I just remind myself of the amazing things that I have done/ that have happened so far. 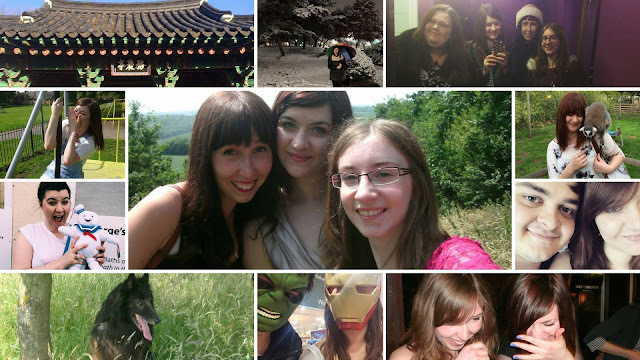 So today I'm sharing with you 24 things that have happened in my 24 years of life. 1. I've fallen in love. 2. I've been to Venice. 3. I've completed a degree. 4. I've started a Masters Degree. 5. I've started a blog. 6. I've been to South Korea. 7. I've seen my best friend start a PhD and the other start a Masters. 8. I've been to London all by myself (huge middle finger to my anxiety). 9. I've seen The Phantom of the Opera on Stage 4 times. 10. I have so many amazing shows on stage. 11. I've stroked a pair of wolf cubs. 12. I've seen Peter Gabriel live twice. 13. I've seen my brother get married. 14. I've volunteered for the Royal British Legion. 15. I've had several lemurs jump on me. 16. I've seen and touched Audrey Hepburn's dress from Breakfast at Tiffany's. 17. I've danced like a crazy person at Reading festival. 18. I've touched a star fish. 19. I've had an amazing weekend trip in Norfolk with my best friends. 20. Started my job at an after school club and got kids interested in mythology through art. 21. I've been covered in paint at the Holi One festival in London. 22. I've celebrated my 3 year anniversary with Dan. 23. I've held a tarantula. 24. I've booked tickets to Tokyo! So there you have it, 24 amazing things that have happened throughout my life. I know some of them may seem little but as clichéd as it sounds its true, it's the little things that make up life. I hope you enjoyed this post. What amazing things are you most proud of?